Nestled in an authentic Breton farm surrounded by greenery, the penty Trinquette is less than 500m from the beautiful beach of Kerler. No sound just the waves over the nearby dunes. You are in this haven of peace called Penty de Kerneing in Mousterlin en Fouesnant. You just have 10 minutes walk to reach the supervised beach in summer. We are in a Natura 2000 area with a multitude of birds and beautiful spaces for jogging. The penty is very nice because it has a veranda which gives the west for breakfast. It also has a south facing flat stone terrace and a private garden with trees. Children have a play area with a large Trampoline (3m wide), a swing, trapeze and rope swing and a slide for the little ones. There is no passage of cars around the penty, children can go to their games. We have the Famille Plus label and we are very proud of it. Heart of several authentic lodgings, the Penty luridly hide in the hollow of the great oaks and Australian eucalyptus trees in absolute silence. The penty, tastefully decorated are very light and bright behind their big granite walls. Spacious and very well equipped, they offer a real space to relax. The tree-lined terraces offer a space protected from winds and looks for moments of rest. At only 500m (10mn walk) the wide beach of Kerler and the white sea give, as yesterday, changing and always different lighting. Only the fields separate the Penty from the Sea! Access to the Kerning Penty is by two private roads of 200 m and 1 km. There is no car passage and calm is assured. Only the sound of the waves passing over the dune can be heard! Welcome to our haven of peace. Un environnement exceptionnel de calme et de tranquillité pour les enfants. Une maison de caractère à la décoration soignée. Un accueil très sympathique. Nous étions très heureux de vous accueillir et sommes heureux d'avoir pu vous apporter le confort d'un lieu reposant et accueillant. Au plaisir de vous revoir dans notre Belle Bretagne. Das Haus ist wie auf den Bildern - sehr sauber, ruhig gelegen, geschmackvoll eingerichtet, zum Meer etwa 10 Minuten zu laufen, Fahrräder stehen kostenfrei zur Verfügung, der wunderbare Bäcker ist wenige Minuten entfernt, die Matratzen sehr angenehm. Es hat uns sehr gut gefallen und Marie, die Vermieterin, ist unglaublich nett und hilfsbereit. Wir waren zwei Wochen zu Zweit im Juni in der Wohung "La Trinquette". Wir haben die Lage auf dem schönen alten Farmgelände, abseits der befahrenen Straßen aber dennoch gut zentral gelegen, sehr genossen. Nachts hört man etwas entfernt die Brandung, morgens wird man nur durch Vogelgezwitscher geweckt. Es ist wirklich sehr ruhig und erholsam. Die Einrichtung ist freundlich hell und ein toller Mix aus Tradition und Moderne, mit einem künstlerischen I-Tüpfelchen in Form von regionalen Bildern, sehr dekorativ und auch käuflich zu erwerben. Die Wohnung hat alles, was man braucht, die Küche ist recht komplett (wenn auch nicht die allerneueste). Der Wintergarten war sehr schön zum Frühstücken, wenn es morgens noch zu kühl auf der Terrasse war. Abendsonne kommt auf die Terrasse bis zum Sonnenuntergang. Zum Meer (schöner Naturstrand) kann man in 10 Minuten laufen - wirklich schön. Marie-Jacq war sehr hilfsbereits und freundlich und man hat sich wirklich willkommen gefühlt. Wir können die Unterkunft wärmstens empfehlen (vielleicht könnte man das Bad mal neu machen - aber ist kein Show-Stopper!). Danke sehr fur ihre schone worter. Wir waren sehr froh sie im penty de kerneing zu haben. Bis bald. We loved the area around the Gites, especially being able to walk along quiet, oak-lined lanes to the beach. 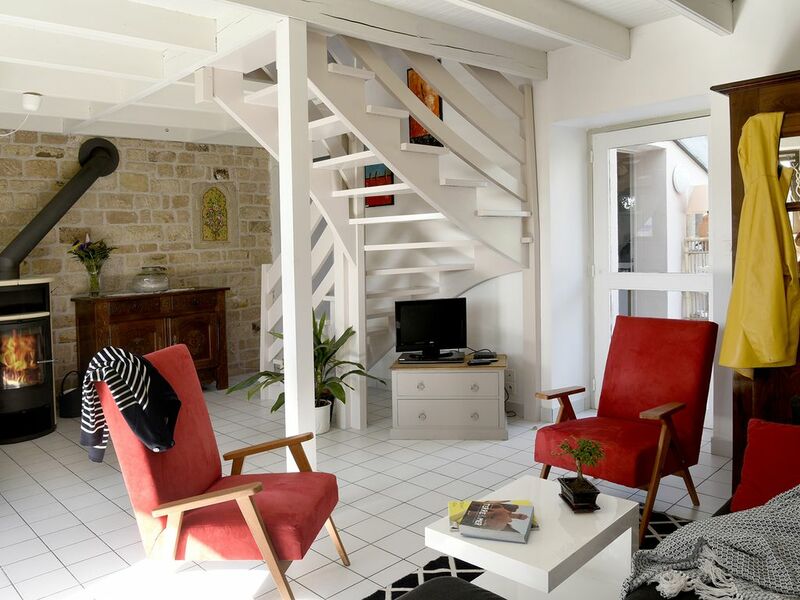 The Gite is spacious and had everything we needed to spend a relaxing week in Brittany. Our welcome was very friendly, and Marie gave us a lot of ideas for interesting places to visit. We liked Concarneau, and enjoyed visiting the port of Guilvenec to watch the fishing boats land their catch. We were very happy to receive you in the Penty de Kerneing. You are welcome again ! Ein gelungener Urlaub, die Wohnung sehr geschmackvoll und zweckmäßig eingerichtet, sehr ruhige Lage, die Fahrräder, die zum Strand etc. kostenlos nutzbar sind, der schöne Wintergarten, sehr freundliche und zuvorkommende Vermieter, viele interressante Ausflugsziele relativ nah, wir haben unseren Aufenthalt sehr genossen! Uneingeschränkte Empfehlung! Familie W.
We are in a place offering a large number of leisure activities within 25 minutes of the Penty. Great sandy beach, beautiful walks on the GR34, near historic towns like Concarneau and Quimper. Access in 1h Glénan islands, a jewel off Fouesnant. The tip of the Raz, the unloading of fishing boats in Guilvinec are other highlights of your visits. In the penty the great wealth is the surrounding calm. Very close to the sea (500m) we have the calm of a real campaign, without car noises! hey, it still exists. - At 500 meters: Beaches and an inland sea, the White Sea, rich in wildlife and ideal for kite surfing! - The Guilvinec and its langoustines - Locronan, medieval town. The Penty de Kerneing are located in Brittany, in its westernmost part, the closest to the 'end of the earth': Finistère. Fouesnant, seaside resort located south of this department, is a city that has long been able to welcome holidaymakers: Beg-meil is frequented since the beginning of the century, including Churchill. Local products have a reputation that goes well beyond Brittany: the Cidre de Fouesnant is a reference, the Cakes Fouesnant are found in all your shops and do you know that it is still the headdress of the traditional costumes of Fouesnant that you see represented to illustrate Brittany: a chance where really a Country with a great personality? Yours to Discover ! - The penty are located in the buildings of a Breton farm, 5 minutes walk from the beach. Only the fields separate the Penty from the Sea! - The nearest beach is 500m away. It is a long tongue of white sand 3kms which allows walking a bit to be really alone on the beach. The dune closes an Inland Sea very rich in fauna. No construction disturbs this peace. We are facing the archipelago Glénan and back to this sea called 'White Sea'. - The access to Kerning Penty is made by two private roads of 200 m and 1 km. There is no car passage and calm is assured. Only the sound of the waves passing over the dune can be heard! - The Penty are in Mousterlin, one of the seaside villages like Beg-meil and Cap-coz that are also part of Fouesnant. Itinerary: South Finistère, expressway RN165 exit concarneau then Fouesnant and finally Mousterlin. A route will be sent on request.